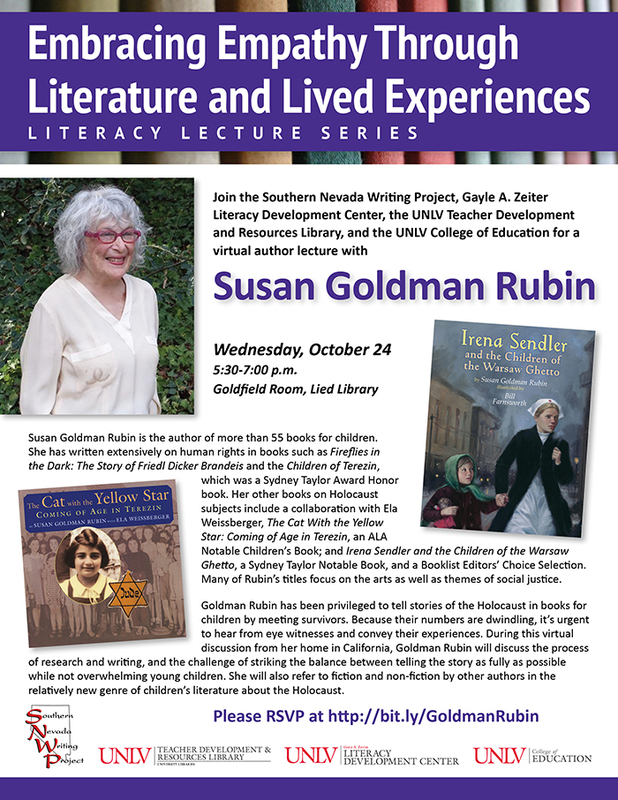 Join the Southern Nevada Writing Project, Gayle A. Zeiter Literacy Development Center, the UNLV Teacher Development and Resources Library, and the UNLV College of Education for a virtual author lecture with Susan Goldman Rubin. book. Her other books on Holocaust subjects include a collaboration with Ela Weissberger, The Cat With the Yellow Star: Coming of Age in Terezin, an ALA Notable Children’s Book; and Irena Sendler and the Children of the Warsaw Ghetto, a Sydney Taylor Notable Book, and a Booklist Editors’ Choice Selection. Many of Rubin’s titles focus on the arts as well as themes of social justice. relatively new genre of children’s literature about the Holocaust.